On December 31, the December Class and Component Prices were announced. Prices were significantly down as shown in the dashboard below. The drop had everything to do with declining exports. See the prior post for more detail on exports. For those who subscribe to the Wall Street Journal, there is an excellent article on the U.S. dairy industry titled "Dairy Factory Gears Up." It discusses a new plant start-up in Cayuga, NY and the impact that global dairy prices have on domestic prices. 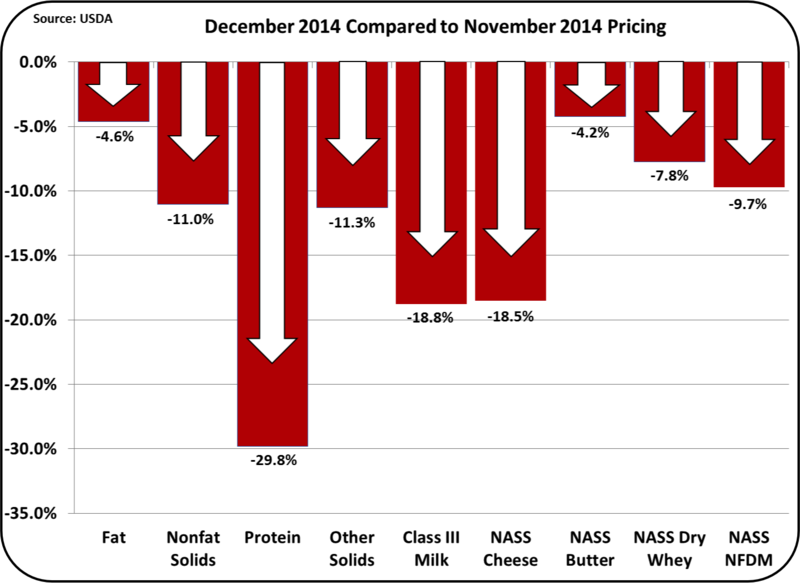 The Dashboard below is 100% red as prices declined for all key dairy pricing statistics. Milk protein dropped the most. It fell nearly 30% from the prior month. The drop in the price of cheese was responsible. 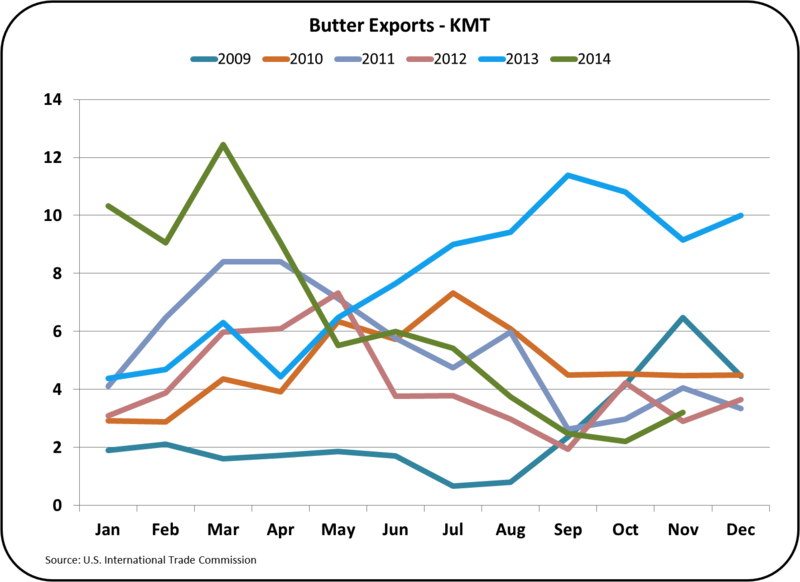 Butter fell the least in spite of extremely weak exports (more on this below). The drop in the cheese price (-18.8%) resulted in an almost identical drop in the Class III milk price (-18.5%) as the two are closely linked by the FMMO formulas. The long-term trend lines reflect the severity of the drops in component prices. Butterfat remains high at $2.10/lb. as inventories remain low in spite of the huge drop in exports. 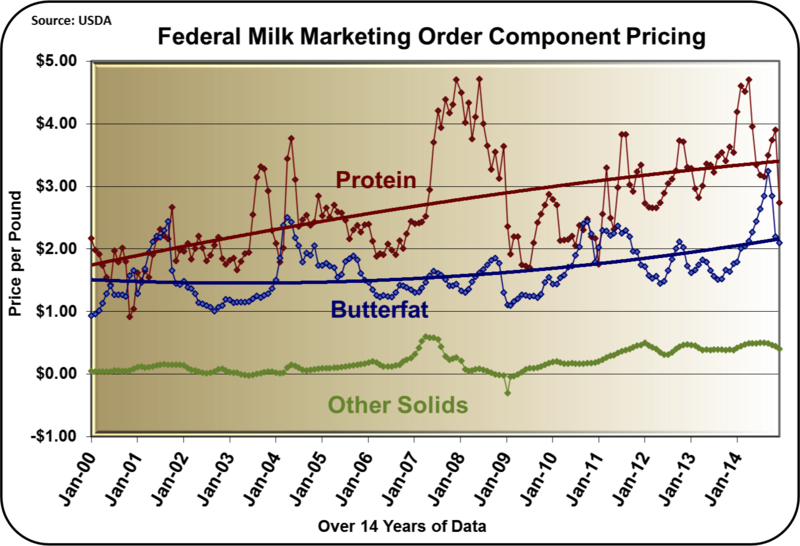 Milk protein at $2.74/lb., has dropped below it's long-term trend line, but remains well above the price of butterfat. Other solids were priced at $.40/lb., the lowest price in 2014 based on weaker exports. The split of payment for the three components remains similar to historic splits, with protein being the biggest contributor. 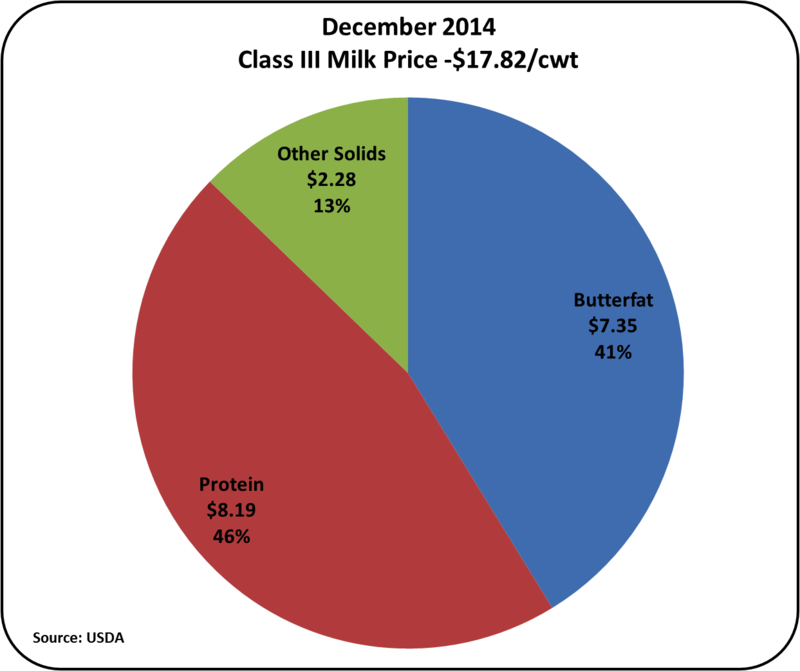 Butterfat remains somewhat larger than historical values, contributing 43% of the milk check. There is one simple reason why butter remains unusually high-priced. Inventories remain extremely low in spite of significantly reduced exports. 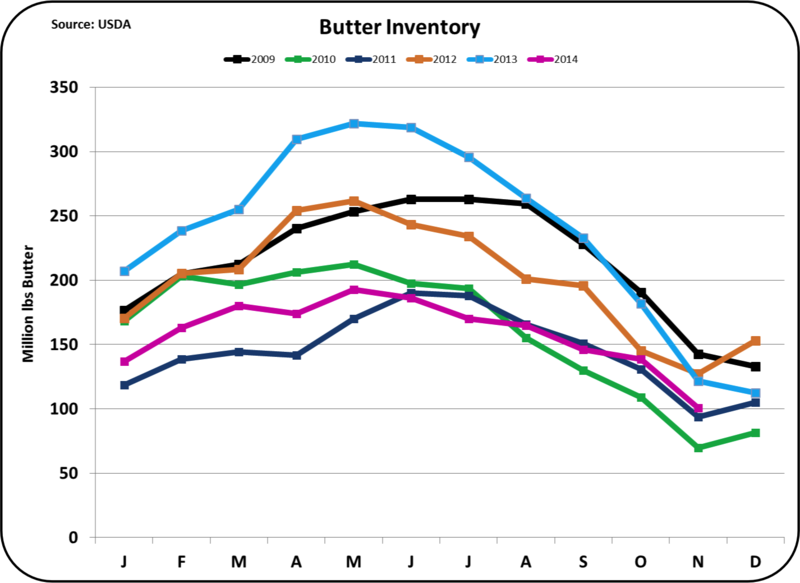 November ending butter inventories are lower than the last three years. They were originally driven down by high exports in the latter part of 2013 and early 2014. For the last seven months, exports have been extremely low, which should have allowed inventories to recover. Exports peaked at 12,000 metric tons and in November fell to 3000 metric tons. The low inventories can no longer be blamed on the earlier high exports. Sufficient time has passed for production to increase and alleviate the tight stocks situation. However, butter churning has not increased over the last year. If fact, the chart below, illustrates the that churning has declined. It's doubtful that exports will fall further. 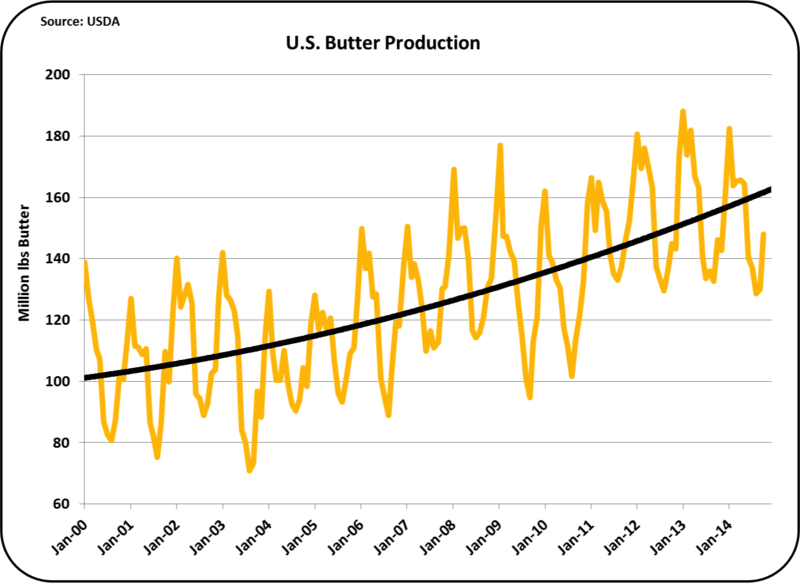 Therefore, low inventories and high butter and butterfat prices will continue until butter churning increases. The price of butter has fallen from historic levels over the last few months, but is still well above historic levels. 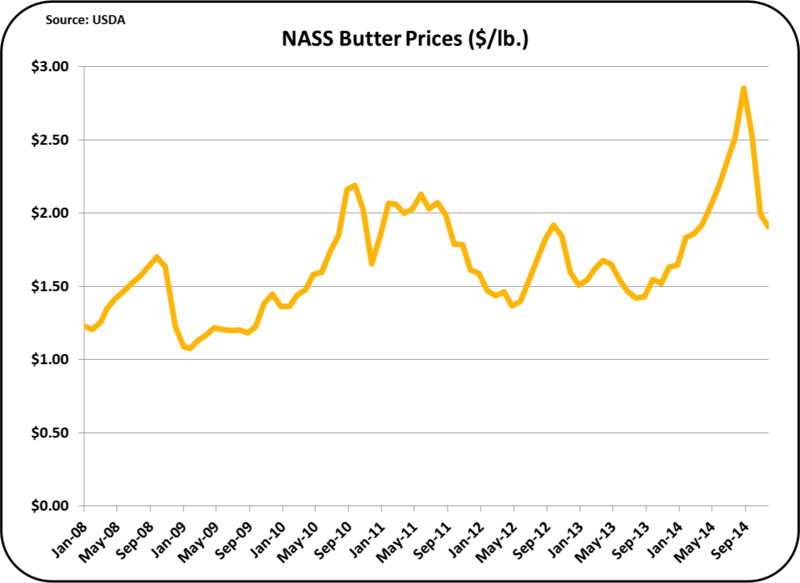 For December, butter was priced by NASS at $1.90/lb. The current futures market is showing a significant drop to under $1.60/lb. for January, with recovery after that to around $1.70/lb. This would bring butter prices to levels near the average of the last five years. This will change the split of Class III milk payment from butterfat to protein, but will have little impact on the Class III price. See the April 9, 2009 post for a review of this relationship. Global events are shaping the current drop in prices. The U.S. is experiencing significant economic recovery, while most of the world is still struggling. While this recovery in the U.S. is admirable, with it comes a stronger USD which makes the U.S. products more expensive on the international markets. With dairy exporting nearly 16% of it's production, the stronger USD can impact the total U.S. dairy demand. The major players in the international dairy markets are Europe and New Zealand. Below are the exchange rates for the USD vs. the Euro and the NZD. Both show the USD continuing to gain strength. 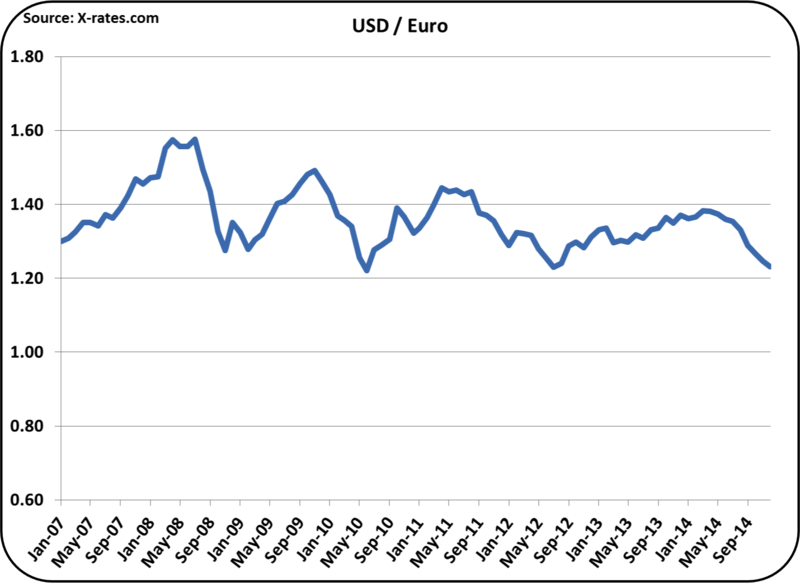 At $1.22 USD for one Euro, the USD is at the lowest point in the last five years. This trend has not changed in the last ten months and the continued recovery in the U.S. vs. a slower recovery in Europe will make this trend continue and the Euro to further weaken. The declining value of the Euro combined with Europe's need for export business to replace the lost exports to Russia, makes for a very competitive international market. 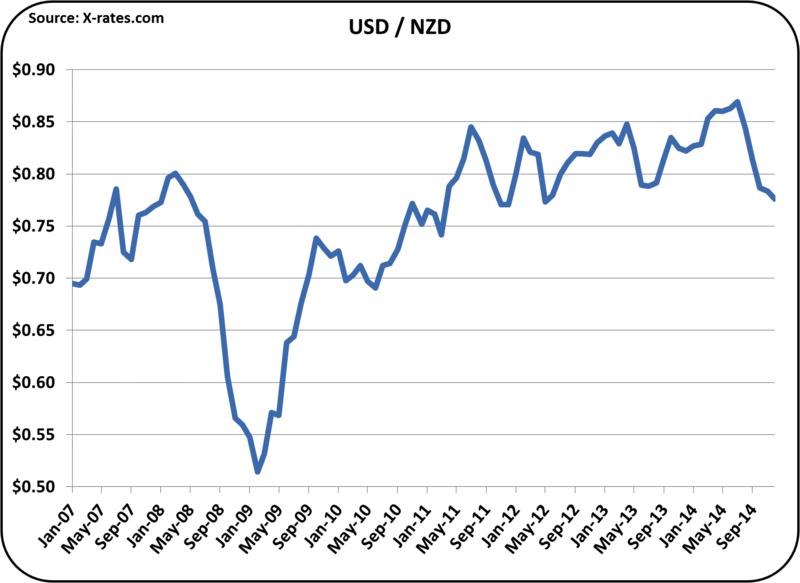 The change vs. the NZD is similar with a trend to a stronger USD and a weaker NZD. This drop is not as dramatic as the drop in 2009, but never-the-less, it does help New Zealand's competitiveness vs. the U.S. in International markets. As additional data becomes available for the full year of 2014, it will be reviewed with additional posts to this blog. As the U.S. joins the international dairy markets as a major player, domestic pricing will largely be determined by international events. The year 2014 has been very good for U.S. dairy producers, but the winds are shifting with strong international competition.